Point of Purchase Display Parts - Round, square & rectangular steel tubing for P.O.P. Displays & racks, including Magazine racks & Battery racks, Swaged tubing for Pole Displays & Spinner Racks. Lamp & Lighting Industry - Lamp & Lighting component parts. Table lamp & floor lamp track lighting fixtures, chandelier, recessed lighting and contract lighting component parts. Tubular Furniture RV Industry - Tubular furniture component parts including chair components, table legs and folding table legs. Lawn & Garden Industry - Component parts for lawn & garden furniture. Beauty Supply Furniture - Foot rests, shampoo chairs and manicure tables. 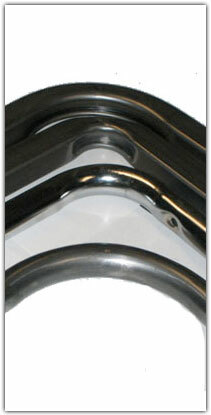 Golf Club Displays - Rack parts for the driving range & golf club stands. Metal Fences - Square & rectangular fences in various sizes. Generator Frames - metal tubular frames for generators and other industrial and commercial equipment. Swaging - Round Tube: Swaging for self-fit display components and industrial applications.